This 41 pages template was submitted by Syarifdigas. 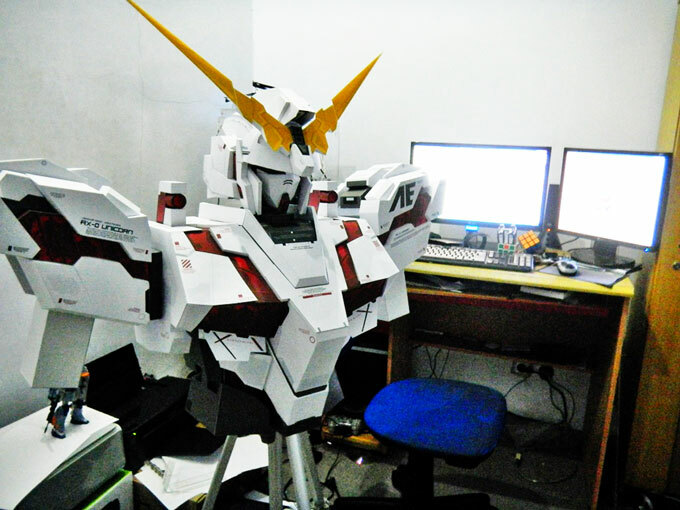 He resized and also build this Unicorn Gundam shoulder part. He use Coreldraw to edit the original file. Almost all Paper Replika's template can be edited by using that vector image editing / designing software, simply by dragging the PDF file onto Coreldraw workspace and enter the usual password. Most of the parts in the template have to break into several parts, Syarifdigas has added alphabet signs as assembly guide. It works like this : in the same part number, combine egdes with the same alphabet, a with a, b with b and so on. In my calculation this Unicorn when completed will has about 2 meters in height.